Get ready for Easter Sunday with these eggy recipes. Get ready for Easter Sunday with these 15 eggy recipes. Suzanne Goin's delicious open-faced sandwiches feature buttery bread topped with gooey cheese, prosciutto and fried egg. This eggy baked pasta is made with sautéed leeks and Greek yogurt. 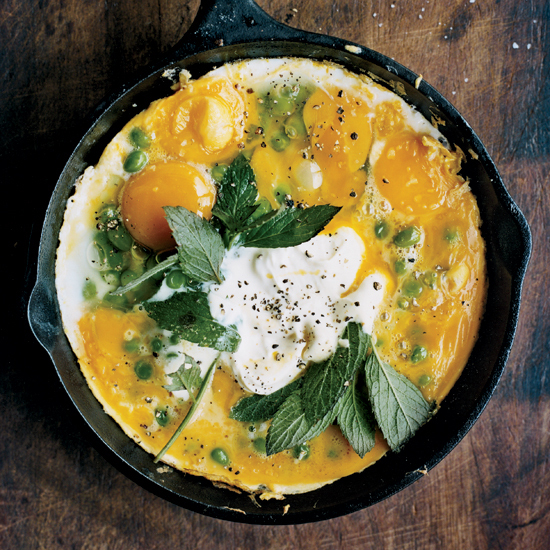 Similar to a frittata, this fantastic dish features fresh spring ingredients like sweet peas and mint. Upgrade a lemony arugula salad by topping it with butter-fried eggs and freshly shaved Parmigiano-Reggiano. This breakfast sandwich piles spicy egg salad on toasted English muffins with warm smoky ham and crisp frisée. Upgrade fried eggs with an unexpected but delicious combination of sunflower seeds, cumin, yogurt and avocado. Nutty-tasting sunchokes make an excellent base for a crispy hash, especially when there's sharp cheddar cheese mixed in and a runny egg on top. David Chang's simple, savory dish is made with barley that's simmered in a mix of cider, chicken broth and kombu seaweed. Save on time by using toasted English muffins for this delicious version of the classic brunch dish. Topped with runny eggs, this delicious dish is perfect for a crowd. These delicious breakfast sandwiches feature bangers (British slang for sausages), eggs and sharp cheddar cheese. This Greek-inspired omelet is made with thinly sliced zucchini and feta. Ready in 40 minutes, this healthy dish is served with warm salsa ranchera made by blending roasted tomatoes, garlic and jalapeños.